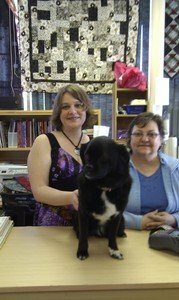 Ibea’s Quilting & Crafts Galore Ltd. opened in 2007 with a desire to share our love of quilting and needlework with our Williams Lake, BC, community and provide a reliable source of fabrics, notions, sewing machines, knitting materials, and quilting supplies. Originally located at 96 Third Ave N., we moved to larger business space in 2010 (at 30 Third Ave N) where we could better meet customer needs with a wider range of products and services. Being a family owned and operated company, we took the first letter in each family member's name (Ian, Brenda, Eric, and Andrea) and added an 's' to the end, to form our business name. It's really appropriate, too, since each one of us is dedicated to helping our customers find enjoyment and success in their chosen craft. Our shop features a welcoming and supportive environment where we host a wide range of classes and workshops in quilting, cross stitching, and knitting, as well as ceramic painting. For the convenience of our customers, we offer qualified on-site sewing machine repairs, in addition to expert sewing machine sales, and thorough machine training.